Man’s capacity for justice makes democracy possible. Man’s capacity for injustice makes democracy necessary. While commentators remain deeply divided on Niebuhr’s legacy (for both theology and politics), it’s interesting to note that his work continues to come back into public view from time to time. He was also the subject of a recent documentary film, directed by Martin Doblmeier, whose film on Dietrich Bonhoeffer received much acclaim few years ago. 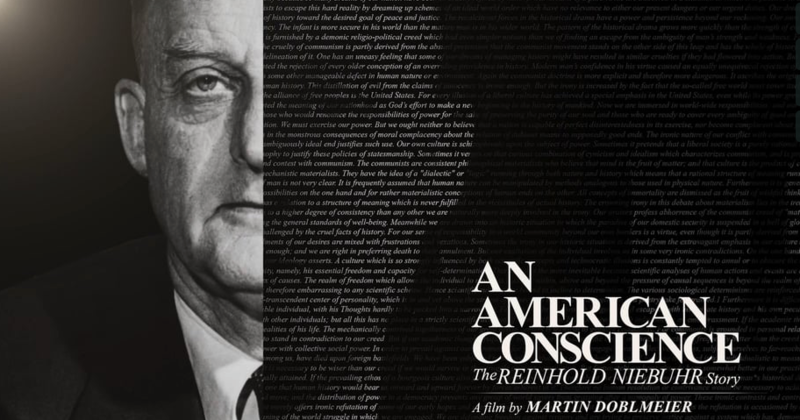 The new film, An American Conscience: The Reinhold Niebuhr Story, includes comments from President Jimmy Carter, civil rights leader Andrew Young, writer David Brooks, theologian Stanley Hauerwas, Cornel West and many others. As we engage students about their sense of calling, about the intersection of their “deep gladness and the world’s deep hunger,” the insights of Niebuhr can perhaps help us avoid being too sanguine.